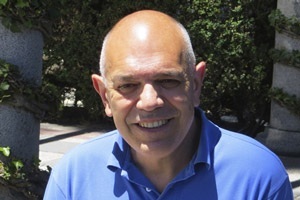 Professor Antonio M. Echavarren is a Group Leader at the Institute of Chemical Research of Catalonia (ICIQ) in Tarragona, Spain and Professor of Organic Chemistry. He is a Thomson Reuters Highly Cited Researcher (since 2014) and a Fellow of the Royal Society of Chemistry since 2012. In 2015, Professor Echavarren received the Arthur C. Cope Scholar Award of the American Chemical Society. Antonio was born in Bilbao (Basque Country, Spain) and obtained his PhD at the Universidad Autónoma de Madrid (UAM) in 1982 with Prof. Francisco Fariña. After a postdoctoral stay in Boston College with Prof. T. Ross Kelly, he joined the UAM as an Assistant Professor (1984-86). Following a two years period as a NATO-fellow in the group of Prof. John K. Stille in Colorado State University, he joined the Institute of Organic Chemistry of the CSIC (Spanish Research Council) in Madrid where he stayed until 1992. That year he returned to the Universidad Autónoma de Madrid as a Professor of Organic Chemistry. He is also Professor of Research of the CSIC since 2004. He was appointed in 2004 as Group Leader at the Institute of Chemical Research of Catalonia (ICIQ) in Tarragona, Spain. My research interests center on the development of new catalytic methods based on the organometallic chemistry of transition metals as well as the synthesis of natural products and polyarenes. Our group mainly works on the design of new gold catalysts and the development of new strategies for the synthesis of complex, biologically active molecules as well as for the synthesis of other molecules relevant in material science.of the CSIC since 2004. What sort of compounds are you screening for antimicrobial activity with CO-ADD? For the CO-ADD screening we are testing several complex molecules synthesized en route to biologically active natural products based on strategies that demonstrate the scope of methods that we have developed using electrophilic metal complexes of gold as catalysts. We have are developing several medicinal chemistry programs at ICIQ for the development of more selective analogues of some antitumor compounds. Joining the CO-ADD initiative has enabled us to further explore the biological relevance of some of our synthetic molecules.